If you see only one city in Japan, Kyoto should be it. Japan’s capital from 794 to 1868, Kyoto is one of Japan’s finest ancient cities, boasting some of the country’s best temples, imperial villas, Japanese-style inns, traditional restaurants, shops, and gardens. Benjamin Disraeli once wrote: “London – a nation, not a city”. If this is true of UK’s major metropolis, it is equally true of Kyoto. This aristocratic city reflects all of Japan, its history, its politics, its art and literature. The city’s literary and cultural history is centuries deep and what comes easily to my mind is Murasaki’s Tale of Genji , the world’s first novel, that took shape here. Kyoto Protocol, the international agreement linked to the United Nations Framework Convention on Climate Change, which committed nations to reduce greenhouse gas emissions was signed here. Even after spending 5 days in Kyoto, the city remained elusive to me and perhaps that elusiveness is its very essence. With Zen gardens, bamboo groves, Buddhist temples and kimino-clad girls shuffling along cobbled laneways, Kyoto seems to be lifted straight from the scenes of an ancient Japanese woodblock print. 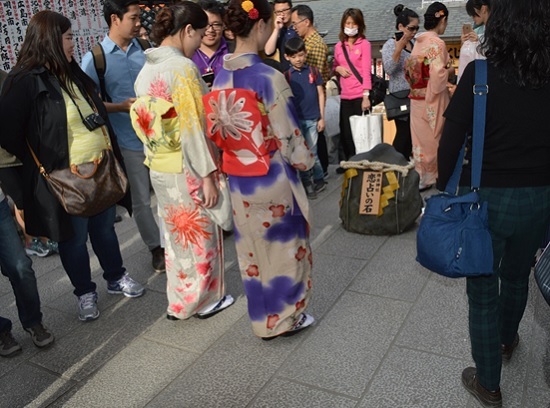 And come cherry blossom season – a national obsession in Japan – the country’s cultural heartland is not to be missed. Signaling the arrival of spring, this season sees cherry blossoms adorning either sides of Kyoto’s canals, hanging low over lakes and transforming gardens into blankets of fairy floss. Few cities can compare with the wealth of Kyoto’s treasures. The city’s tourist office lists 17 World Heritage sites, 90 gardens, 140 museums and galleries, 177 festivals, 471 notable temples and Shrines, as well as 263 other nature spots , for nature-viewing is also part of Kyoto’s rich heritage. It is not merely the quantity, but the stunning quality of these monuments and gardens that put them at the top of the world. It is said that if Japan was a human being, Tokyo would be its brain, Osaka its stomach and Kyoto its heart. A tourist who has only limited days to spend in Kyoto has to be extremely choosy in deciding and exploring the finest from the hundreds of fine monuments and historical sites that the city lavishly offers. I have therefore captured here for my narration only those destinations that I visited. Imbibing the sentiments of TS Eliot, I am sure that I will return to this city again and know it with renewed wonder. This was my first destination after landing in Kyto as it was touted as the most popular destination in Kyoto. Kinkakuji (Golden Pavilion) is a Zen temple built in the 14th century in the Rokuon-ji temple complex as a retirement villa for Shogun Ashikaga Yoshimitsu and features a three-story pavilion covered in gold leaf with a roof topped by a bronze phoenix. 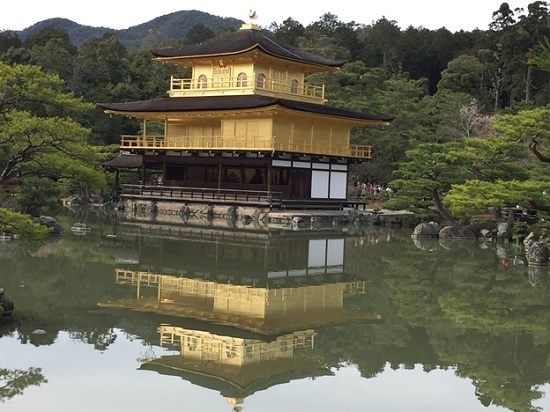 Kinkakuji is quite impressive at first glance itself as it was built overlooking a large pond. But for those who have seen the Golden temple in Amritsar, the villa per se offers less enchantment. However, the setting of this villa surrounded by the Japanese strolling garden with the shimmering reflection of the pavilion captured in the pond against blue sky is indeed enchanting. I was told that the man who built it was a kind of Nero and lived lavishly while the rest of the nation wallowed in famine, earthquakes, and plague. On July 2, 1950, the pavilion was burned down by a fanatic 22-monk who after made an unsuccessful attempt of suicide. The present pavilion was rebuilt in 1955 and in 1987 and the gold leaf covering was made five times thicker than the original coating. The surrounding park with its moss-covered grounds and teahouses are sheer delights. Ryoanji Temple is the site of Japan's most famous rock garden and is located near Kinkakuji temple. 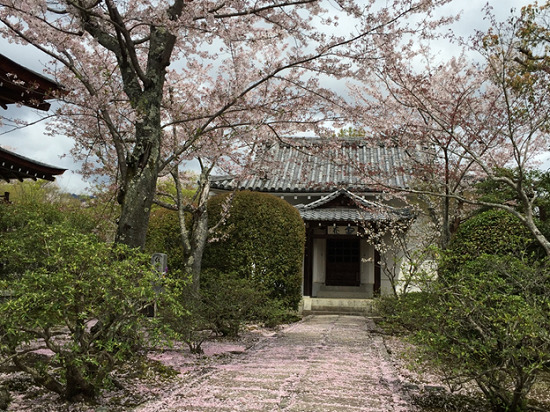 Originally an aristocrat's villa during the Heian Period, the site was converted into a Zen temple in 1450 and belongs to the Myoshinji School of the Rinzai sect of Zen Buddhism. The garden consists of a rectangular plot with fifteen rocks set in waves of raked white pebbles which is bounded on three sides by a clay wall and on the fourth by a wooden veranda. An interesting feature of the garden's design is that from any vantage point at least one of the rocks is always hidden from the viewer. Along with its origins, the meaning of the garden is unclear. Some believe that the garden represents the common theme of a tiger carrying cubs across a pond or of islands in a sea, while others claim that the garden represents an abstract concept like infinity. 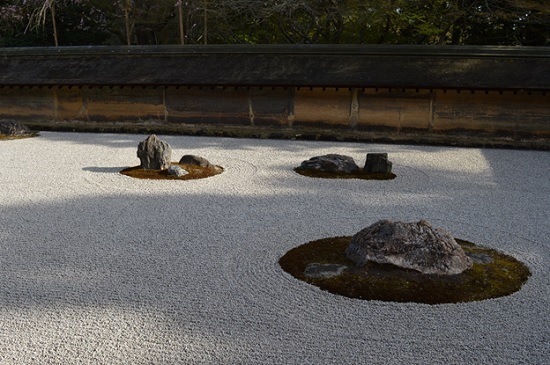 Because the garden's meaning has not been made explicit, it is up to each viewer to sit and contemplate what the designer tried to communicate with the rocks and its spatial pattern. 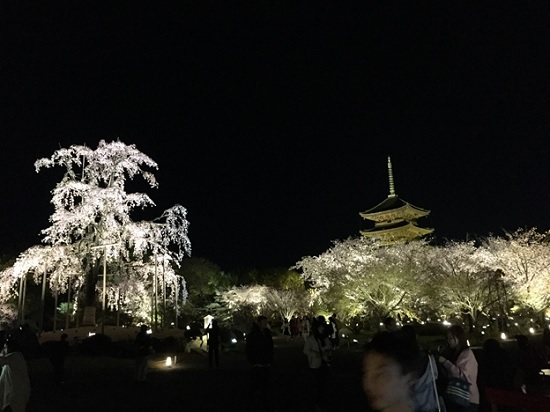 I will benchmark the amazingly beautiful and spacious garden built around the temple with its cherry blossoms, ponds and bridges as one of the finest in Kyoto and an ideal spot to relax in quietude. Visiting this crowded tourist friendly temple is thoroughly a delightful experience. The entire temple complex includes sub- temples, waterfalls and sanctuaries. This ancient temple was first built in 798, but the present buildings are reconstructions dating from 1633. As an affiliate of the Hosso school of Buddhism, which originated in Nara, it has successfully survived the many intrigues of local Kyoto schools of Buddhism through the centuries. A bustling hive of activity perched on a hill overlooking the basin of Kyoto, Kiyomizu-dera is one of Kyoto's most popular and most enjoyable temples. It may not be a serene station that many would associate with Buddhist temples, but it represents the popular expression of faith in Japan. Its main hall is constructed over a cliff and features a large wooden veranda supported by 139 pillars. The main hall is dedicated to the goddess of mercy and compassion, but most visitors come for the magnificence of its height and view. 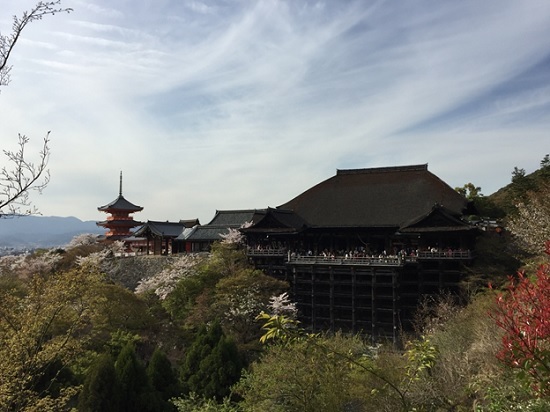 Kiyomizu's grounds are particularly spectacular in spring during the cherry-blossom season and in fall during the turning of the maple leaves. Also worth checking out are the three-story pagoda and Otowa Falls (known for the purity of its water; kiyomizu translates as "pure water"). 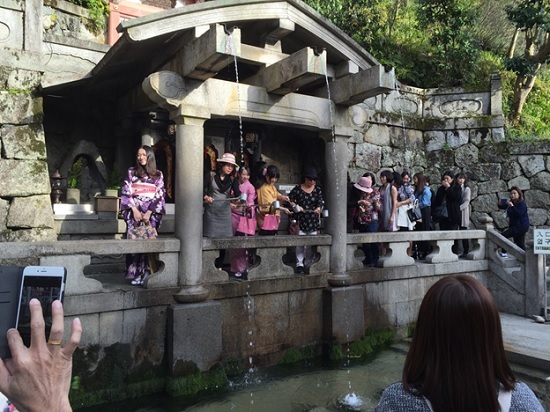 Its waters are divided into three separate streams, and visitors use cups attached to long poles to drink from them. Each stream's water is said to have a different benefit, namely to cause longevity, success at school and a fortunate love life. However, drinking from all three streams is considered greedy. At Jishu-jinja, the shrine up the steps above the main hall, visitors try to ensure success in love by closing their eyes and walking about 18m between a pair of stones – if you miss the stone, your desire for love won't be fulfilled! You can ask someone to guide you, but if you do, you'll need someone's assistance to find your true love. Imagine you are entering a hall with closed your eyes and then open it suddenly. What you see in front can be the most spellbinding spectacle you have ever imagined. 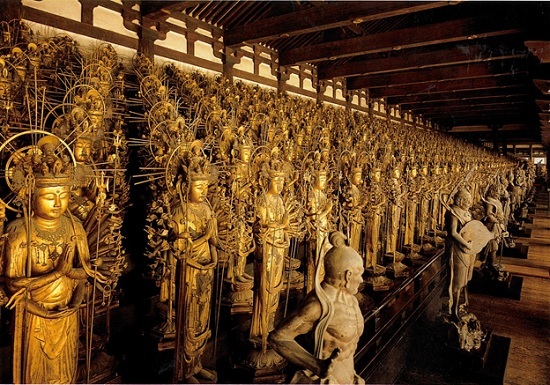 You see 1001 wooden statues of thousand armed life-sized Kannons (bodhisattva associated with compassion as venerated by Mahayana Buddhists ) made of Japanese cypress clad in gold leaf in all its splendor. Around the 1000 Kannon statues stand 28 statues of guardian deities. Interestingly many of these guardian deities bear the names of Hindu Gods, demons and Goddesses like Sridevi, Indra, Vishravana , Vayu, Garuda, Brahma and Narayana. Originally founded as Rengeoin Temple in 1164 and rebuilt in 1266, Sanjusangendo Hall measures 120 meters and is Japan's longest wooden structure. The name Sanjusangendo (literally "33 intervals") derives from the number of intervals between the building's support columns, a traditional method of measuring the size of a building. In the center of the main hall sits a large, seated Kannon carved in 1254 by Tankei, a famous sculptor from the Kamakura Period. Flanked on either side of this humongous Kannon are 500 statues of 1000-armed Kannon standing in ten rows. Together they make an awe-inspiring sight. Unfortunately, no photos are allowed inside. Ginkakuji, a Zen temple, was built in 1482 as a retirement villa for Shogun Ashikaga Yoshimasa, who intended to coat the structure with silver in imitation of the Golden Pavilion built by his grandfather. He died before this could be accomplished, however, so the Silver Pavilion is not silver at all but remains a simple, two-story wood structure enshrining the goddess of mercy and Jizo, the guardian god of children. The entire complex is designed for enjoyment of the tea ceremony, moon viewing, and other aesthetic pursuits, with a beautiful garden of rippled sand, rocks, and moss. The beauty of nature in each different season is adapted skillfully in the garden giving the atmosphere of a profound spiritual world in the temple garden. Along the walking path of the garden is a massive sand cone named "Moon Viewing Platform". The sand mound is molded to resemble Mount Fuji, and the sand is raked in the shape of waves, created to enhance the views during a full moon. The walking path then takes visitors through Ginkakuji's moss garden, which features ponds with islands and bridges, little streams and various plants. The path climbs a hill behind the buildings from where there are nice views of the entire temple grounds and the city. The name Philosopher's Pathway refers to the fact that, throughout the ages, philosophers and priests have strolled this tranquil canal path in deep thoughts. It's a particularly beautiful sight in spring during the cherry-blossom season. The pathway runs almost 1.8km (1 mile), allowing you to think your own deep thoughts, and begins on the right side of the main entrance to Ginkakuji temple and ends in the neighborhood of Nanzenji. The path follows a canal which is lined by hundreds of cherry trees. 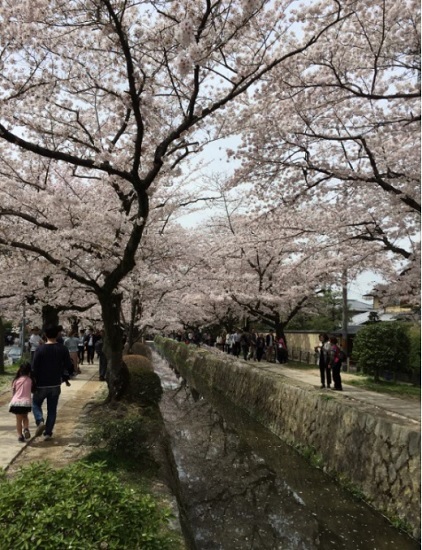 It was a splendorous sight to watch uninterrupted canopy of cherry trees in full bloom on either side of the canal making the walk one of the most beautiful experiences in Kyoto. Restaurants, cafes, and boutiques can be found along the path, as well as a number of smaller temples and shrines which are a short walk from the canal. 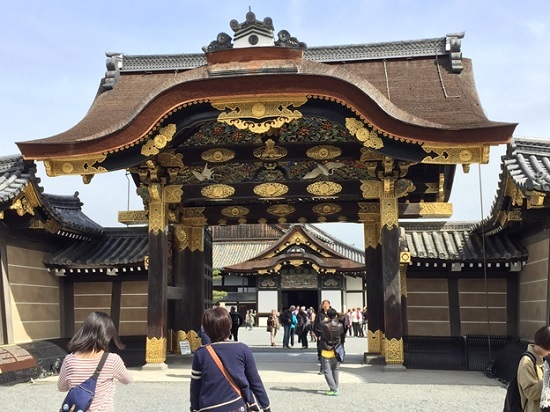 The most notable of the temples are Eikando Temple, Nanzenji Temple and Heian Shrine. Nijo Castle was built in 1603 as the official Kyoto residence of Tokugawa Ieyasu, the first shogun of the Edo Period (1603-1867). His grandson Iemitsu completed the castle's palace buildings 23 years later and further expanded the castle by adding a five-story castle keep. Nijo castle is the epitome of Momoyama culture in Japan, as it makes splendid use of early Edo period building designs, lavish paintings, and carvings. The castle is built almost entirely of Japanese cypress and boasting delicate transom woodcarvings and paintings by the Kano School on sliding doors. Unfortunately, no photos are allowed inside. After the Tokugawa Shogunate fell in 1867, Nijo Castle was used as an imperial palace for a while before being donated to the city and opened up to the public as a historic site. Its palace buildings are arguably the best surviving examples of castle palace architecture of Japan's feudal era, and the castle was designated a UNESCO world heritage site in 1994. Nijo Castle is divided into three areas: the Honmaru (main circle of defense), the Ninomaru (secondary circle of defense),the garden that encircles the Honmaru and Ninomaru. The entire castle grounds and the Honmaru are surrounded by stone walls and moats. Outside of the Ninomaru Palace extends the Ninomaru Garden, a beautiful traditional Japanese landscape garden with a large pond, ornamental stones and manicured pine trees. 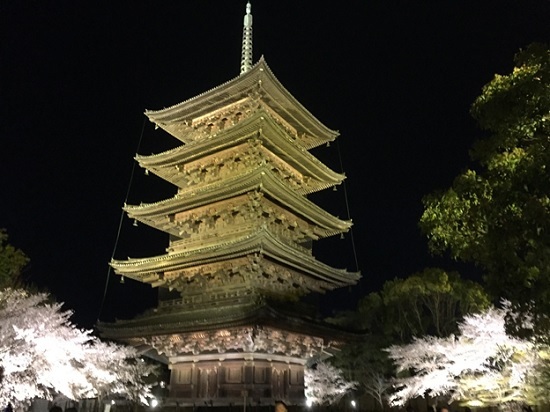 The elegant pagoda of Toji Temple, one of the oldest temples of Japan, can be seen from the Shinkansen (bullet train) as you come into Kyoto as this five storied 55 KM high pagoda tower is the tallest pagoda in Japan. It was founded in 794 on imperial orders from the Emperor Kammu to pray for national peace and in 823 was given to Kobo Daishi, the founder of the Shingon school of Japanese Buddhism. I visited this temple at night and being the spring season, it was beautifully illuminated. Viewing the towering pagoda against the weeping Cherry blossom tree was magical. Nishi Honganji and Higashi Honganji are two large temples in the center of Kyoto. As headquarters of the two factions of the Jodo-Shin Sect (True Pure Land Sect), one of Japan's largest Buddhist sects, they are a good place to experience contemporary Japanese Buddhism. The pure Land teachings established by Shinran Shonin (1173-1263) tell us that all are embraced by the power of Amida Buddha's Primal vow. Entrusting in the view enables all to live in the present with confidence and peace of mind. The purpose of this teaching is to enable all to live lives to the fullest, becoming aware of both potentials and limitations in the world. Nishi Honganji (West Honganji) was built in 1591 by Toyotomi Hideyoshi and its two largest structures are the Goeido Hall (built in 1636), dedicated to Shinran, the sect's founder and the Amidado Hall (built in 1760) dedicated to the Amida Buddha, the most important Buddha in Jodo-Shin Buddhism. Both the halls are designated as National treasures of Japan. The temple also displays some surviving masterpieces of architecture from the Azuchi-Momoyama Period and early Edo Period, including the celebrated Hiunkaku Pavilion. 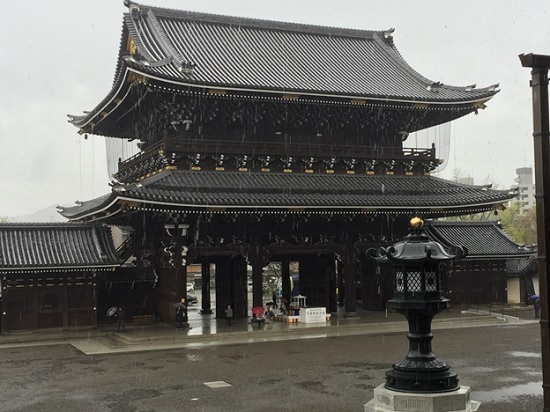 Higashi Honganji (East Honganji) was built only eleven years after and a few street blocks east of Nishi Honganji as the head temple of the Otani faction of Jodo-shin Buddhism. 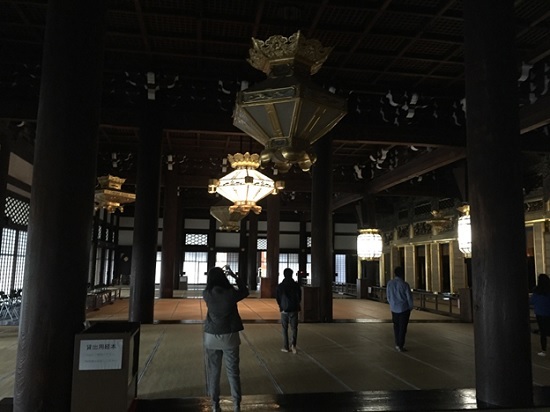 Its main hall, the Goeido is Kyoto's largest wooden structure and dedicated to Shinran, the sect's founder. Next to it and almost as large is the Amidado Hall, dedicated to the Amida Buddha. A small Japanese garden named Shoseien is located another few street blocks east of Higashi Honganji and serves as a detached temple residence of Higashi Honganji. Arashiyama and Sagano, two adjoining neighborhoods at the base of Kyoto’s western mountains, form the city’s second-most-popular sightseeing district. The major attractions here are Tenry?-ji, a temple with a stunning mountain backdrop, and the famous Arashiyama Bamboo Grove. 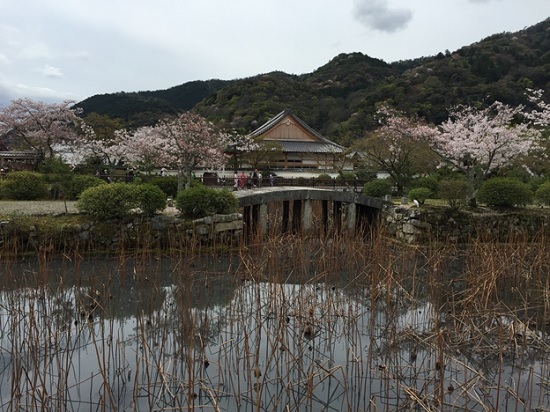 Arashiyama is a pleasant, touristy district and the area has been a popular destination since the Heian Period (794-1185), when nobles would enjoy its natural setting. Arashiyama is particularly popular during the cherry blossom and fall color seasons. This area is best explored on foot , as I did, because there is something to see everywhere along the way, including wonderfully lush temples and shrine compounds, old private villas, and narrow streets lined with craft and souvenir shops. Listed below are the destinations I chose to visit during my two nights stay in Arashiyama. Tenryuji Temple is the most significant temple in Kyoto's Arashiyama district. It was placed first among the city's five great Zen temples belonging to the Rinzai Zen sect of Buddhism. It was built in 1339 on the old site of Go-Daigo’s villa after a priest had a dream of a dragon rising from the nearby river. The dream was seen as a sign that the emperor’s spirit was uneasy and so the temple was built as appeasement – hence the name tenry? (heavenly dragon). The present buildings date from 1900. This temple is situated near the Arashiyama’s famous bamboo groves. Unlike the temple buildings, Tenryuji's garden, one of the most attractive stroll gardens in all of Kyoto , survived the centuries in its original form. 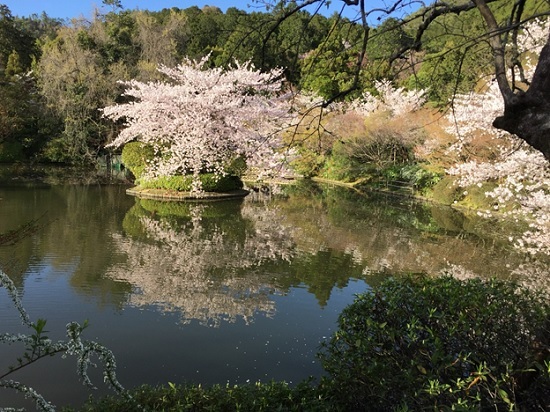 Created by the famous garden designer Muso Soseki, who also designed the gardens of Kokedera and other important temples, the beautiful landscape garden features a central pond shaped like heart surrounded by rocks, pine trees and the forested Arashiyama mountains. Muso Soseki also served as Tenryuji's first head priest. This garden is ambrosia for the eyes with Cherry blossoms, Azaleas, iris, pine and maple and many other plants abloom in every corner. The garden must be dazzling with all the hues in autumn. 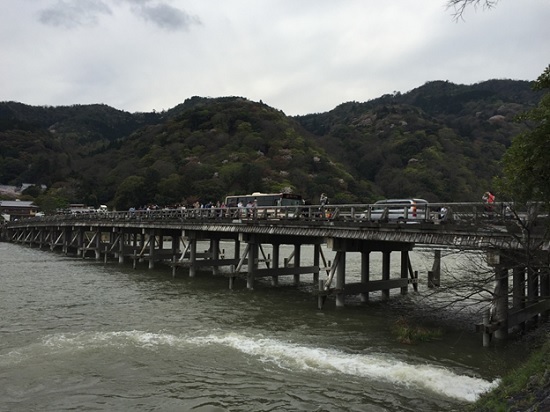 The Togetsukyo Bridge (meaning "Moon Crossing Bridge") is Arashiyama's most iconic landmark. It was originally built during the Heian Period (794-1185) and most recently reconstructed in the 1930s. The bridge looks particularly attractive in combination with the forested mountainside in the background. A riverside park with dozens of cherry trees is located just adjacent to the bridge offers very good backdrop. It was raining heavily when I visited the bridge and the hazy ambience only intensified the beauty of this scenic spot. Recently married bride and bridegrooms could be seen stopping by the bridge to get photographed. The Japanese have a long history with bamboo, in myths and legends, metaphorically linking a man’s strength with this plant. Many festivals also include the use of bamboo in various forms. We can see that from bamboo ice cream cups, buildings and fences. However, it is not often we get the chance to see bamboo forests in their natural state that grow thick and line the path like they do here. 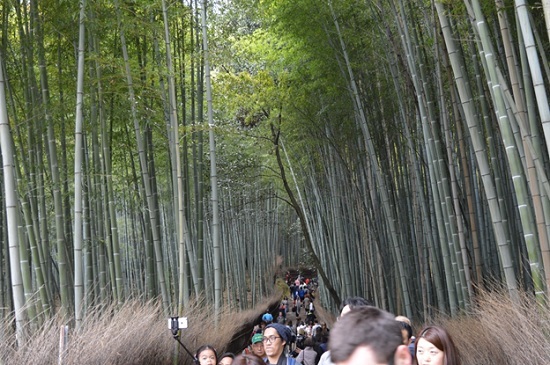 The sprawling bamboo groves in Arashiyama is quite impressive though was not as imposing as I had imagined. The groves are particularly attractive when there is a light wind and the tall bamboo stalks sway gently back and forth. This was the private villa of the famous silent-film era actor Okochi Denjiro (1896-1962), located in the back of Arashiyama's bamboo groves. He constructed this unique garden villa on the south side of Mount Ogura over a 30 year period. Okochi Sanso consists of several different gardens and buildings, including living quarters, tea houses and gates. 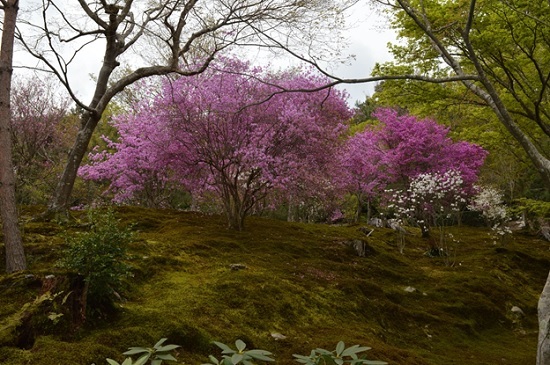 A number of pine trees, cherrytrees and maple trees seasonally color the vast garden. 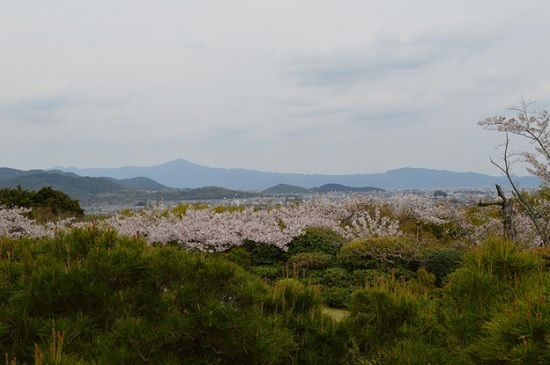 Some vantage points near the buildings offer grand views of Arashiyama and Mount Hiei . The garden has also a stream from the Hozu river running through it. Okochi was a great admirer of Zen Philosophy. 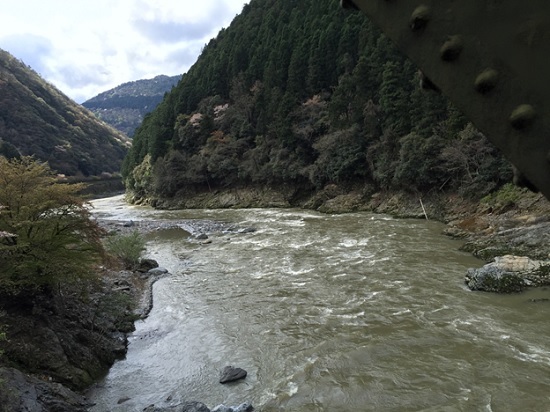 The Saga Scenic Railway runs seven kilometers from Arashiyama to nearby Kameoka, mostly alongside the pretty Hozu River. The trains travel at a maximum speeds of about 25 km/h during their 25 minute journey, so passengers can enjoy the scenery without it rushing by too quickly. Interestingly the captain of this train allows passengers to be photographed standing in front of the train wearing the captain’s hat. Kyoto is a rich and incredibly loveable city. There are many places where one can enjoy authentic Japanese cultural experiences in Kyoto every day. It is left to the traveler to explore and experience the traditional culture of Japan in the many traditional temples and sites which can be found only in Kyoto. Staying near Kyoto railway station would be a good idea as the bus station is close by. Kyoto is home to some of the country’s best Ryokan (traditional Japanese inns). I strongly recommend that tourists visiting Kyoto spend their first night in a good ryokan: it’s the quintessential Japanese experience. Most of the destinations in Kyoto can be reached by bus. There are many good Indian restaurants near the Kyoto railway station. My favorite was Ajanta Indian restaurant. Visit to Arashiyama is best done by train.